As experts warn regions up and down the East Coast of a massive “tick explosion” headed for us this summer, New Jersey may now be home to a rare species of the small arachnids. Mather even spearheads an entire website dedicated to monitoring the impending Planet of the Ticks – TickEncounter – offering tips on how to avoid ticks throughout May and June, which are cited as the “tickiest months” on the site’s Facebook. With this threat, Mather notes, the East Coast is harder hit by Lyme disease than anywhere else in the country. If untreated, Lyme disease can cause flu-like symptoms in people, and in worse cases spread infections throughout the heart and nervous system. To steer clear of ticks this season, TickEncounter points out that you have to be extra careful monitoring your pets when they run freely through the wilderness (or your fenced in backyard). A group of ticks could cling on and be hard to spot in your pet’s fur. 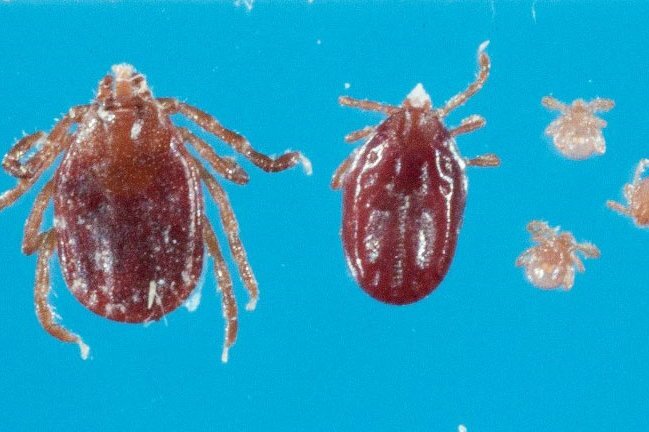 This is the latest in disturbing local tick news after an exotic species more common in Australia and Asia made its way to Hunterdon County, New Jersey, last year, when a sheep that had no history of foreign travel was infested with thousands of the ticks. Now, officials are saying the species has survived the winter and may have become an established group in the state. According to Patch, the species can grow up to the size of a pea. It's still a mystery how the bugs ended up in New Jersey. "State and USDA employees will be working with the public to determine if the tick has spread to new areas and to educate the public about protecting livestock and pets from this pest," the NJ Department of Agriculture said in a statement. The species, named Haemaphysalis longicornis Neumann, is known as a cattle tick and is more common to warmer regions. It has been linked to other human diseases commonly linked to ticks, including Lyme disease and several bacterial and viral diseases.